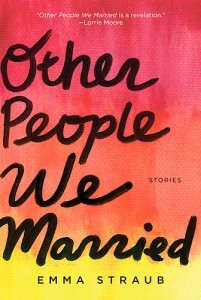 PLG resident, Emma Straub‘s debut short story collection, “Other People We Married” will be published in February by Five Chapters Books. It is a collection of stories Emma has written over the past few years, and it also includes her novella “Fly-Over State.” The book has received some great early reviews. There will be a launch party for the book this Thursday, January 27th at 7PM at Brooklyn’s own BookCourt, where Emma also works. BookCourt is at 163 Court Street (between Pacific & Dean), 718-875-3677. There will be also be a reading at McNally Jackson in Soho on February 16th at 7PM.